. Hopefully we enjoyed our summer as much as we did . From Fribourg Pride in Switzerland, Europride in Marseille, visited Circuit Festival in Barcelona and promoted the ski week in Sitges, Ibiza and Mykonos. 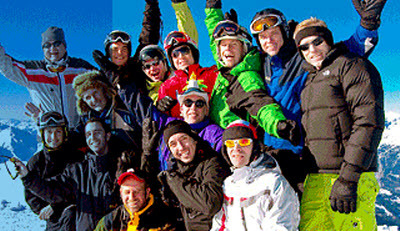 Today , one of the biggest LGBT winter sports events in Europe, ten years on from our small and humble start: Arosa Gayskiweek. In celebration of the 10th. anniversary they have compiled a fantastic holiday program to ensure the guest have an amazing time . Not only is it the 10th. anniversary this season, but it is also the first winter that the slopes of Lenzerheide will be connected to those of Arosa, making for an even more impressive ski area, with more runs for you to enjoy. Thanks to the new peak-to-peak Arosa-Lenzerheide connection (opening December, 2013), two ski areas become a new winter paradise and will enter in the Top 10 of the biggest ski areas in Switzerland! 42 modern transport facilities will offer to skiers and snowboarders 225 km of well groomed pistes as well as 50 km freeride powder and a fun snow park. The slopes are suitable for all levels of difficulty, from beginner to expert: fun guaranteed! 7 nights at the nice mittendrINN B&B in a double room with shower/bath and toilet, including a delicious breakfast at the rate of CHF 455.- (€375.-) per person (sun-sun). Participants under 25 year will be able to purchase the Event Pass gold at a special rate of only CHF 150. And – last but not least – they offer a dinner special in partner restaurant: Get 4 dinners (Mon, Tue, Thu and Fri) including starter and main course at only CHF 75. Looking forward to 12th January 2014 to celebrate the 10th Anniversary! There are still rooms left . See link. HEAVENUE COLOGNE A new the gay christmas market in Cologne : HEAVENUE COLOGNE , at the Schaafenstrasse Cologne. Winter Party Festival in Cologne Winter Party Festival in Cologne! 3-Day-Party Marathon from Nov 30th to Dec 2nd called "St. Nicholas Festival 2018"
FOLSOM 2018 Berlin Folsom Europe 15 years of meetings , parties and fun in Berlin . The Street Fair will open its gates September 8th at noon. Berlin CSD Pride 2018 On July 28, 2018, the 40th CSD Berlin draws under the motto "My body - my identity - my life!" through the capital. Equal Rights for the Unequal! - Lesbian and Gay Festival Berlin Under that slogan Berlin's Regenbogenfonds e.V. will present its 26th annual Lesbian and Gay Festival - Europe's largest. Messages of love around the world on London Pride 2018 Messages of love around the world on Gay Pride London on Saturday July 7 with the Pride parade and the Trafalgar Square Stage and lot of events in Soho and Vauxhall.